It is no surprise (to modern readers of the Gospel anyway) that Jesus restored the man’s sight. So instead, let’s focus on the disciples’ assumption that the man’s condition must have been a punishment for someone’s sin. Jesus quickly relieves them of this notion, but it’s part of a theology that persists. Maybe it’s a defense mechanism: if we can blame someone’s misfortune on their mistakes, we worry less it might happen to us. Unfortunately, we seem to extend that line of thinking in additional directions. While today we are less likely to blame the physically disabled for their condition, we are relatively quick to blame the poor, the mentally ill, refugees, and other groups for theirs. Some circumstances are certainly a result of poor choices, but we like a convenient excuse for responding with non-demanding judgment rather than with compassion insisting on action. “But wait,” you may be thinking, “didn’t Jesus say the man was born blind for a purpose?” Yes … and no. What does it mean for God’s work to be revealed through the needy? Not that they’ve been capriciously selected for suffering so God can show off. If the work of God’s children is to love God and one another, then the greater the need we meet, the greater the revelation of God’s glorious work. Christ’s message to the healthy and wealthy is not: “be kind to the needy.” The message is: “You are the needy.” Indifference, selfishness, and judgment erode the spirit every bit as much as poverty, illness, and oppression erode the flesh. And the remedy for poverty of the spirit is identifying with poverty of the flesh so closely that any unbound wound is felt as our own. Apart, we are a meaningless tangle of misery. Together, each of us is a knot reinforcing a tapestry woven from mercy. Comfort: We are blessed with a purpose that unites us with each other. Challenge: When we know someone who suffers, let us try to understand how we are related to both their suffering and their well-being. Prayer: God of all creation, teach me to love all your children. Amen. Discussion: How do you understand the relationship between sin and suffering? There’s a type of message that seems to pop up frequently in social media. It generally says: “Take me as I am or watch me as I go.” Intended as a phrase of self-empowerment, it may be exactly that for people who’ve suffered rejection for something beyond their control. However, when it’s used to deflect criticism, dismiss self-reflection, or justify one’s own needlessly abrasive behavior … it’s the message of a child. Mature people remain open to change and growth. They also realize other people’s feelings do actually matter. But it’s a balancing act. Considering other people’s feelings doesn’t mean betraying our own values. Cursing like a sailor at a church bake sale (or proselytizing at an explicitly secular event) is merely offensive, not principled; on the other hand defending free speech may require us to offend some people. Being authentic doesn’t mean expressing every thought that comes into our heads regardless of circumstance. We all learn to moderate ourselves around our bosses so we don’t lose our jobs; we should have the same respect for people who don’t hold power over us. The Apostle Paul was too devoted to his mission to simply make controversial proclamations and end with: “Take me or leave me.” Rather, he developed relationships by empathizing with – and perhaps more importantly building relationships with – those he wanted to reach. As he wrote to the church in Corinth, to the Jews he became as a Jew, to the weak he became weak, to those under the law he became as one under the law. He never sacrificed his core message, but customized his delivery for the sake of the Gospel. Paul knew relationships supersede religion. We don’t persuade by judging; we persuade by engaging. Our lives are more fulfilling when we find ways to point our core values and true selves toward service. If we have a big mouth, we can speak for the voiceless. If we are flamboyant, we can draw focus where it will do good. If we have a dark sense of humor, we can bridge the gap between suffering and ignorance. Don’t ever be ashamed of your story and truth, but remember you share space with other equally deserving stories and truths. Comfort: It’s good to be yourself. Challenge: It’s not so good to use “being yourself” as an excuse to be hurtful to others. Prayer: Lord, I know you have created me for service. Help me to let let my gifts shine in ways that honor you and the creation you love. Amen. Discussion: Do you ever struggle to balance being authentic with being loving? After Jesus declared that those who ate his flesh and drank his blood would have eternal life, murmuring broke about among the Jews. Many struggled to understand his meaning. Others said more directly: “This teaching is difficult; who can accept it?” Jesus replied: “Does this offend you? […] The words that I have spoken to you are spirit and life.” As a result, many disciples turned away from him. We can draw a couple lessons from this. First, be careful about pledging yourself to a person or cause. Once you’ve jumped on a rolling bandwagon, it will be difficult to jump off with dignity while it’s still moving. Eventually preachers, politicians, denominations, parties, etc. will take a stand you can’t agree with. Pragmatism, pressure, and pride regrettably sway people who want to retain influence. If you followed them out of a sense of tribal loyalty, you may feel betrayed by that difference in opinion, possibly needing to turn away from them entirely. It’s wiser to attach ourselves to issues and principles rather than affiliations so we feel free to agree or disagree with a person or group without feeling conflicted. Second, God is going to make demands of us we won’t like. In such cases, our own opinions and preferences matter little. As God said to Moses, and as Paul recalled in his letter to the Romans: “I will have mercy on whom I have mercy, and I will have compassion on whom I have compassion.” In other words, it’s God’s show to run, not ours. The consequences of doing the right thing may seem mysterious or unfair, but since our one true loyalty lies with God, we still need to do it. Comfort: Jesus offers the words of eternal life. Challenge: We must accept them even when they seem hard. Prayer: Lord, teach me to lean not on my own understanding, but to trust you with all my heart. Amen. Discussion: Does your faith ask anything of you that you don’t particularly enjoy? and for practicing oppression and violence. Fair wages. Dishonest gain. Excess ignoring need. Oppression. Social justice is inseparable – perhaps indistinguishable – from faith. Jeremiah, Jesus, Paul … these Biblical voices seem far less concerned with whether we hold other people accountable for their misdeeds than with whether we hold ourselves accountable for doing mercy and justice. Jeremiah’s audience probably thought their cedar-paneled wealth was a sign God favored them, when the opposite was true. Lyn White of Animals Australia wrote: “The greatest ethical test that we’re ever going to face is the treatment of those who are at our mercy.” She was referring to animal cruelty, but this idea applies to people as well. If we are financially comfortable, lots of people are at the mercy of how we choose to use our resources. The pennies we save choosing cheap prices over fair labor practices; the time we spend evaluating the merit of the poor and needy rather than helping them; the violence we allow to continue because confronting it is inconvenient; Jeremiah could easily be addressing these sins today. Only a couple more weeks remain in this Lenten season. Let us take time to reflect on how Jeremiah still speaks to us – not some general “us” but us personally. Comfort: God craves justice for the poor and oppressed. Challenge: Work on thinking of justice not as punishment for those who steal bread, but as contributing to a kingdom where no one goes hungry. Prayer: God of Abundance, teach me to be generous with all I have, and stingy with my judgments. Amen. Discussion: Would you pay more for something if the extra cost guaranteed someone would not go to bed hungry? Have you ever tried to give up excess sugar? At first it’s an unpleasant mixture of headaches, cravings, and fatigue. After a while those symptoms fade, and you start to feel pretty normal – maybe better than normal, without all the highs and lows of unsteady blood sugar. Eventually candy and soda may become so unbearably sweet on the tongue that you wonder how you ever enjoyed them in the first place. Your appetite changes, and you are better off for it. The Apostle Paul tried to teach members of the Christian church in Rome about changing their appetites. He knew many of them still had more of an appetite for the flesh then the Spirit. When he tells them “those who live according to the flesh set their minds on the things of the flesh, but those who live according to the Spirit set their minds on the things of the Spirit,” he knows they aren’t excited to give up their earthly habits cold turkey. He also knows that by practicing a life in Christ (and enduring a few resulting headaches and cravings) they will wean themselves off a taste for sin. Maybe they’ll begin to wonder why it was ever so appealing. Years before Paul wrote to the Roman church, Jesus spoke to the Jews about an appetite change. The Pharisees wanted a sign from him, like the manna they ate while wandering the desert after fleeing Egypt. For a time manna was necessary for survival, but it was limited. Manna, gathered in the mornings, would not keep overnight and rotted away before morning. Instead he offered them himself as the Bread of Life: “Whoever comes to me will never be hungry, and whoever believes in me will never be thirsty.” To develop a taste for that bread, they would have to stop feasting on the law which they craved but could no longer sustain them. To savor a better life, we must sometimes figure out which lesser appetites we have been feeding instead. Whatever sweet temptations we think we can’t live without, Jesus promises us something far better. Comfort: God always has something better in store. Challenge: Make a list of what appetites – social, physical, mental – you give too much priority. Then write down some goals and strategies for changing that. Prayer: Abundant Lord, I wish to be filled with the Bread of Life. Amen. Discussion: What’s your favorite food? Is it good for you? We’re prone to judging people, including ourselves, as morally weak or strong depending on whether we believe they have a little or a lot of it. 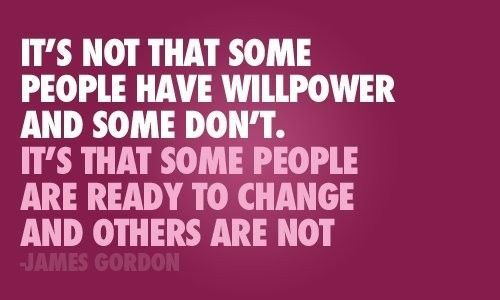 We blame poor willpower for addictions, eating disorders, bad habits, cowardice, and any number of human failings. Recent studies, however, indicate that reliance on willpower alone to change behavior may actually set us up for further failure. To understand a behavior is more than understanding what we do, but why we do it. The Apostle Paul was ahead of the research on this one. He freely admitted: “I do not understand my own actions. For I do not do what I want, but I do the very thing I hate […] I can will what is right, but I cannot do it. I do not do the good I want, but the evil I do not want is what I do.” He described his mind as a slave to God, but his flesh as a slave to sin. Repenting of a behavior is more complicated than declaring, “I am done.” It’s unfair to expect that of ourselves. We owe it to ourselves and to God to take the time to understand why we gossip (or cheat or lie or whatever it is we wish to change). Repentance starts with a decision, but we may need to find ways to reinforce that decision every day – perhaps every hour – for a long time. Prayer is the best start, but we shouldn’t be ashamed to employ all the tools necessary to be successful. Those tools may include everything from daily affirmations to professional counseling. We may need to physically alter our environment; if so, let’s think of that as a sign not of our weakness, but of our dedication. We may need to leave behind friends who undermine or mock our efforts. Backsliding may be part of the process. Willpower tells us backsliding is failure; repentance tells us backsliding signals time for another change of direction away from the darkness and toward the light. Viewed through eyes of grace, our imperfections are not barriers between us and the divine, but invitations to more fully understand ourselves and our God. Comfort: God’s love is unconditional. Yes, that was yesterday’s comfort as well. Repeat as necessary. Challenge: Read this short article on changing bad habits, and maybe seek out others. Prayer: Holy and forgiving God, thank you for being by my side both when I fail and when I succeed. Amen. Discussion: What’s the most difficult habit or behavior you’ve broken? Upon passing a site undergoing renovation, a quick glance may not reveal whether it is in the stages of demolition or construction. They can look similar for a long time. The church has been undergoing renovation for centuries, and to bystanders (and members) the status may not be quite clear. What do we think when we hear someone described as “religious?” Even if we consider ourselves religious, we may not automatically assume that person is similar to us. Increasing numbers of Americans—including those who regularly attend Christian churches—identify as “spiritual but not religious” to avoid the stigma of religion. For their book unChristian, David Kinnamon and Gabe Lyons surveyed a group of young Americans—Christians included—and 85% or more described Christians as hypocritical and judgmental. 70% described them as insensitive to others. We can be reasonably skeptical about statistics, and some of the authors’ conclusions about how the church should respond are debatable, but are the results surprising? Not really. As the church, let’s follow Paul’s advice to the Romans and spend less time denouncing the world and each other, and more time building each other up. When people hear “Christian” they should think of people who share with anyone in need, who visit the sick and imprisoned, and who love God with “gladness and sincerity of heart” (Acts 2:46). If Christianity is known mostly for the things Christians won’t do and the people they won’t embrace, whose fault is that? If our main concern is moralizing when we are as prone to sin as anyone, why wouldn’t the world see us as hypocrites? Some people will always be intractably bigoted against the religious, but our reputation is our own responsibility. We can change the perception of the world by choosing to build rather than demolish. This broken world needs people who participate in mending it, not in grinding it into irrecoverable pieces. Early Christians stumbled and lost track of the Good News when they began judging each other. Maybe we can avoid the same mistakes by asking not who is sinning, but who is hungry, ill, poor, or unloved. Comfort: If you’re doing what’s right, the world’s judgment doesn’t matter. Challenge: Be a builder, not a destroyer. Prayer: God of creation, help me represent my faith well. Amen. Discussion: Have you ever caught yourself being a bad representative of Christianity? It’s good to keep your freezer full, but not overly so. Solid items are easier than empty space (or mostly empty space) to keep cool, so it shouldn’t be empty. However, too many (or improperly placed) items can restrict the air flow necessary for proper operation. This can result in frost build-up, uneven cooling, and wasted energy. Ovens, especially convection ovens, also work best when there’s enough space for airflow. We human beings also operate better when we leave room for the Spirit (or as it’s called in Greek, pneuma which also means breath or air). Take the Pharisees for example: Jesus told them, “you cannot accept my word.” Why not? Because their hearts were so crammed full of religion there wasn’t room for revelation. Ever seen a freezer whose contents have frosted into one giant immobile block? That’s what happens to a heart so overloaded with dogma, doctrine, and doing that nothing else – even the divine breath – can enter it. We can’t be so concerned with preserving the past that we ignore the present and oppose the future. While the freezer preserves, the oven prepares. But we have to be sure we’re not putting too much in there at once either. Faith is not a body of knowledge to be contained and mastered, but an experience to be lived. We can cram countless theological concepts into that oven, but without time and space to expose them to the breath of the Spirit they may turn out to be half-baked. Sure your theology of suffering may have browned up nicely, but if it’s just one of many recipes you’ve rushed to complete, instead of testing thoroughly, it may still be a gooey, useless mess inside. Our ideas about God shouldn’t crowd out our experience of God, or those ideas won’t sustain us in times of need. As with physical possessions, we may be surprised by how few mental possessions we really need to get by. At some point they become idols clogging our spiritual airways. Let’s preserve the essentials, prepare what’s been entrusted to us, and periodically check for an expiration date on the rest. Comfort: You don’t have to fill up every space and second. Challenge: Every day, take time to breathe deeply. Prayer: God of mercy and love, I seek to sink deeply into your Spirit. Amen. Discussion: When’s the last time you really cleaned out things you didn’t need?